For our latest blog, Tom Ryalls gives us a glimpse into his life growing up and dealing with epilepsy. Can You See into a Black Hole? arrives at CPT on Tue 16 – Wed 17 April 2019 at 9pm. Click here for more information. Growing up with epilepsy can often be isolating and full of misinformation, the focus of care is usually on enabling parents or carers to feel medically prepared to support a young person during a seizure. But, there’s a lot of other things happening at the same time. While people around me were worrying about my brain I was worried about what dating would be like as a teenager with epilepsy. Would I seizure on a boy while trying to kiss him? Would I ever go to University or would I have to live at home forever? Would I ever meet other people with epilepsy? I didn’t even meet anyone with epilepsy until about 7 years after being diagnosed a woman had a seizure in front of me in Doncaster train station. I was in such a state of shock at meeting someone else that I froze and could do nothing to help her. Thankfully other people began to do first aid and call an ambulance but I ran away. I’ve always really regretted that moment, I can still perfectly hear the sound of her head hitting the floor. Now one of my best friends has epilepsy and I’ve spent the past year talking to loads of people with experience of it. I’ve also managed to answer most of the questions I had as a teenager and I know how valuable this knowledge would have been to Teenager-Tom. I’m currently working on “Can You See into a Black Hole?” which is a show about growing up with epilepsy. I didn’t realise this when I started writing it but this show is a letter to my younger self. It says all the things I wish someone had said to me when I was a teenager. I think it’s full of hope and answers to questions that I thought I would never get answered. As the Black Hole Project expands I’m asking other people to do the same thing. I’m asking people who grew up with epilepsy to write letters to their younger selves with as much honesty as possible, to equip their younger selves with the answers they have now because there will be other people going through the same thing. I like to think that, if there had been something like this for me as a teenager, that day in Doncaster train station would have gone differently. These will then become part of an e-zine I am curating which is a survival guide for young people and teenagers living with epilepsy. It’s like a free tiny magazine you can download online. Contributions might not be letters; they might be pictures or poems or photos. To ask any questions or to send a submission please get in touch with [email protected]. All contributions will be published unless they are deemed offensive. All contributions can also remain anonymous unless you’re happy to make your name and any other details about your epilepsy public. 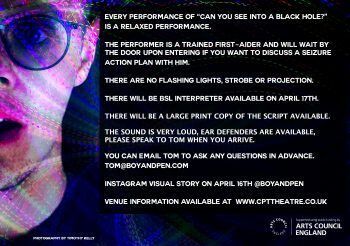 Alternatively, there will be a submission box for letters after every performance of “Can You See into a Black Hole?”, which is playing at Camden People’s Theatre Tuesday 16 & Wednesday 17 April. Click here for more info and tickets!